Born in 1963 in Recife, Brazil, Britto was one of nine children growing up in an impoverished home. Despite a lack of resources, he expressed a desire to become an artist at the age of 8. His mom chastised him for doodling in his notebooks because they didn’t have the money to continually buy new ones. As an alternative, Britto painted on scraps of cardboard and newspaper, often using his fingers when he didn’t have brushes. At the age of 14, Britto revealed his art to the public for the first time in an exhibition held by the Organization of American States. He received honors for his works, but was unsure of developing a career in art. He instead pursued an academic path at the Catholic University of Pernambuco on a scholarship. When starting his third semester, Britto realized his true passion was for art, but waited another two years before traveling to Europe to study art and painting. In 1983 he visited Paris, where he caught his first glimpse of artwork by Henri Matisse and Pablo Picasso. The techniques of both Matisse and Picasso would forever shape Britto’s artistic career. 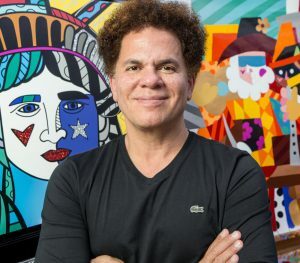 In 1988, Britto immigrated to the United States, settling in Miami. Becoming an international artist was life-altering for Britto. In 1989 he was selected by Absolut Vodka, following in the footsteps of notable artists like Andy Warhol and Keith Haring, to create custom 25th-anniversary bottles for the Absolute Art Ad Campaign. This incredible opportunity catapulted Britto into the limelight. Throughout the years, Britto has loaned his talent, energy, and time to more than 250 philanthropic causes, such as the Andre Agassi Foundation for Education, Best Buddies International, the World Economic and Development Fund, and St. Jude Children’s Research Hospital. In 2007, the artist also established the Britto Foundation, which provides support to those who work to create, promote, and encourage humanitarian-based initiatives that benefit children around the world. Britto states that it is a tremendous personal reward to know that his art can make a difference and inspire others to give. Britto continues to paint and reside in Miami, with his studio located in the city’s Wynwood Arts district. He is married to Cheryl Britto and has a son, Brendan, whose toys growing up are the inspiration for some of Britto’s bright colors. Britto’s self-taught style is a combination of Cubism, Pop Art, and graffiti. His vivid color palette, bold lines, and imaginative patterns are instantly recognizable. Although he calls himself a Pop artist, the Cubist elements in Britto’s work should hardly surprise viewers—few artists in modern times have escaped the long shadows cast by Picasso and Georges Braque. Britto’s style emerged from these influences in the form of dazzling colors, pop imagery, playful themes, and an inventive signature within his paintings. Optimism is vital to the essence of Britto’s art. His unique visual language encourages hope, positivity, and happiness. “I hope when people see my art they have a big smile on their face and a huge one in their heart,” Britto says. Britto works in a variety of mediums, including watercolor, lithography, acrylic, sculpture, and three-dimensional serigraphy. His art has been shown in more than 140 galleries and museums nationwide, including the Louvre Museum (Salle Le Norte Paris), France, Today Art Museum in Beijing, China, and the Florida Museum of Hispanic and Latin American Art in Miami. His commissions include: Grand Marnier, Volvo, Apple Latin America, Pepsi-Cola, IBM, Disney, the United Nations, Mini Cooper for BMW, the Mariner of the Seas for the Royal Caribbean Cruise Line, and BankAtlantic. Britto created artwork in 2010 and 2014 for FIFA World Cup as well as the 2007 Super Bowl. His public sculptures are featured throughout the world, including Florida, Germany, Washington D.C., and New York. NetDragon Websoft commissioned him to create the largest commissioned sculpture in Asia for their headquarters in Fuzhou, China. Collectors of his work include Michael Jordan, Arnold Schwarzenegger, and Andre Agassi as well as the Guggenheim family, the Rothschilds, the Kennedys, the Mitterands, President Barack Obama, and former Whitney Museum President, William Woodside. In 2012, Britto’s work was honored at Brazil’s annual Rio de Janeiro Carnival, a five-day celebration held 40 days before Easter. He has been profiled in numerous national publications including People Magazine, Art News, Variety, and Leaders Magazine. Britto served as the Brazilian ambassador for the 2016 Summer Olympics held in Rio, Brazil. Coca-Cola commissioned him to create artwork for the event and nominated him to carry the Olympic torch in his hometown of Recife. In 2017, the Star Art Foundation commissioned Britto to create a work of art presented to His Holiness Pope Francis in Rome. The work was titled “Pope Francis – The Protector of the Poor and Peace Maker” and was a symbolic gesture of thanks for the pope’s support of the In Defense of Christians Foundation.